Just got this in the mail. 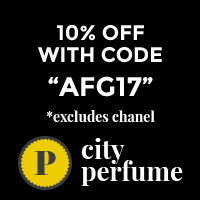 One of my favourite independent perfumers and the scents will blow your mind. I have a few bottles and two of these fabulous sample cases here at Chez Turbo and they often get an airing to recalibrate my fragrant expectations. Sometimes when I’m bogged down in the mire of conventional scent I open a sample pot of La Via Del Profumo and it reminds me that scent can be astounding, heartbreaking, beautiful and magical.